The Project Food Blog Challenge championed by Foodbuzz is an exciting adventure, and it is great to be a part of this opportunity along with the online foodie blogger community. Having started the Cajun Chef Ryan (CCR) blog in May of 2008; it has grown into something more than ever imagined over just two years ago. And with this post, I hope to convey the uniqueness of the CCR blog, what set’s it apart from other food blogs, and why I have what it takes to be the next food blog star. Moreover, coming up with what describes me as a food blogger with just over 29 months of blog history, I decided to find out for myself what illustrates the Cajun Chef Ryan blog. The Danish philosopher Soren Kierkegaard said, “Life can only be understood backwards; but it must be lived forwards,” so lets go back and see what CCR has been up to for the past few years to understand our story. A page from the Culinary Apprentice Log Book, an example of the document and account from the culinary formative years. This is Ryan at work on a mirror display at a Garde Manger class, and an example of sharing the early days in the industry, Cold Food Presentations and Displays ~ Garde Manger. Looking back, the CCR blog has evolved from a quiet little place where original recipes from my bygone era in the restaurant business get documented and recorded for preservation, and today, where we share a world of cuisine. The CCR blog is also a place for home cooks and foodies alike; they join in comment, and share their own piece of culinary history through guest blog posts. Over the short period in existence, the CCR blog has added over 300 posts, with 6 pages, in 71 categories, including over 1,335 tags, has accumulated over 3,100 approved comments, and gathered a legion of fellow foodie friends and family from social networking sites including Foodbuzz, Stumble Upon, Cook Eat Share, BloggerAid, Facebook, and many others. Shrimp and Grits, just one of the popular Southern favorites we share on the CCR blog. However, the CCR blog is so much more than just the collection of posts and comments; it is a location and tool for preserving my culinary and cultural heritage. It is a place to share my world of cuisine. It is a setting for learning more about myself and continuing to grow in my writing and photography abilities. It is a community where I have met many new like-minded folk from around the world, who also enjoy the finer pleasures of gastronomy. I blog for many motivations, one of which is to find and meet new friends who share experiences with food, family, and friends, another is to share my twenty one plus years of experience and knowledge base accumulated from my restaurant era. 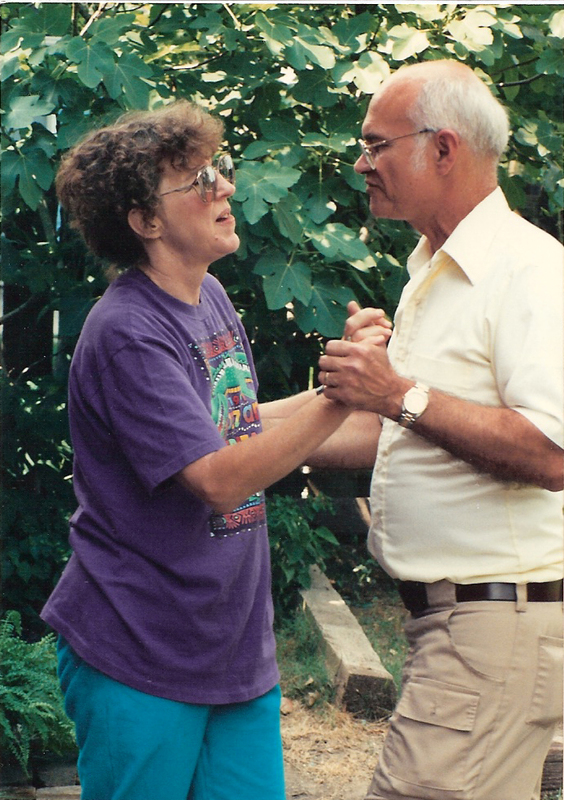 Mom and Dad Boudreaux Cajun dancing next to the fig tree in the back yard. This photo was captured during one of many crawfish boils we prepared over the years. I actually started cooking at home at age thirteen, and my passion for food and edible ingredients is still unbounded. For example, figs are one of those ingredients that just does it for me, I melt when I find them fresh and ripe for the eating. We had two fig trees in our back yard, one would produce four times as much as the other, guess it was the age, or orientation to the planets. Walking out the back door and picking a dozen or more figs at a time and just throwing them in, savoring the sun kissed warmth of summer succulence, nature appreciated. The sweet natural sugars and fig juices squeezed with every pinch off the tree, creating a mouthful of earthly delight, divine rich flavors from Gods creation, fruits of the earth, nourishment for the body, pleasures for the mind, and spirits for the soul. I am lucky to tolerate just about any foods and ingredients, knock on wood! However, I have a vast appreciation for those who are not so fortunate. In fact, I spent over seven years of my restaurant career in the health care field in the capacity of chef, then director of food and nutrition, and I can tell you that there are plenty of dietary guidelines that require specific challenges with each plan. Food is so much about experiences, good or bad, and sharing them with those you love. Celiac disease is just one of those intolerant food illnesses, which I came to know well in the late 1970′s when my father was diagnosed with the illness. At the time my mother and I were on a baking binge and producing loaves of whole wheat, double cracked wheat berry, and rye breads in huge amounts. My dad would eat a loaf of bread a night, we did not know it then, but our bread baking was making him sick. After ten days in the hospital and in great pain, the doctors discovered that the cilia in the lining of his intestines were swollen up so much; he could not absorb any nutrients. A biopsy of the intestinal lining confirmed the illness. My dad to this day maintains a gluten free diet, and it is personal stories like this that I continue to share through the CCR blog. You would think that with a blog entitled Cajun Chef Ryan, that all you would find is Cajun inspired recipes. Not so, in fact, while the name contains “Cajun”, and I am a Cajun, I enjoy a world of cuisine, and this is why my blog description “Feeling and sharing a world of cooking, more than your average Cajun” stands at the masthead of the CCR blog. Is Cajun Chef Ryan all about Cajun Cooking? The CCR blog is Cajun, but whole lot more! In the 300 plus blog postings, only 39 are listed in the Cajun category. In all considerations, it is humbling how much CCR has accomplished looking at where we have been, and now making a difference for tomorrow. As the motivational speaker Krish Dhanam says, “You are not responsible for your heritage, but you are accountable for your future.” You may not get to choose your parents, but what you make of your life is entirely up to you. Continuing to enjoy a world of cuisine, one fork full at a time! Great post Chef Ryan! I enjoy your blog and appreciate your recipes and insights into the different world cuisines. All the best for Project Food Blog! Go get ’em! You’re going to do SO WELL. Hey Birin, thank you so much for your support. Greg, thank you so much for the vote! Hi Emily, thank you, it is exciting already as I prepare for round two, and round one has not even opened up voting! Foodbuzz chose well in their first challenge. I am having such a great time reading the backgrounds of the blogs I love to visit. Good Luck! Hi Kristen, me too, and I learned somethings about myself also in the process. Hi Dana, thank you so much! Dear Cajun Chef Ryan! You are such an inspiration and have a wisdom about cooking that I have admired from first stumbling into your blog (from Foodbuzz, in fact!). While I do not linger in FB as much lately, I cherish the folks like you I’ve met. I think you are being humble here in your post–no mention of working with Julia or Emeril ? (I know name dropping. . . )–but in my humble opinion, this win should be in the bag for you! I’ll visit FB just to vote! Keep the good cajun food coming and my fingers are crossed for you! I’m a fan of yours Chef Ryan, I really feel like I’m learning something when I visit your site. I love how accomplished you are, yet still approachable, keep up the good work! Good Luck in PFB! I’m enjoying getting to know everyone better so much, aren’t you! You will do awesome, I just know it, your blog is great! You certainly have my vote!! You are a pleasure to know. You are humble, inspirational and I believe approachable and helpful to your community. Keep up the excellent work, friend. awesome good luck love your entry! Very interesting and well-done, Chef. The first challenge was a very introspective exercise. I’m enjoying reading everyone’s entries. Good luck. Really enjoyed all the story behind the CCR and the yummy effort you’ve put. A great post for the 1st challenge! Best of luck in the contest! Great article. It is nice to get to know you a little better and I love your blog. The best of luck to you. Good luck Chef Ryan! I enjoyed ready about your background and felt a real connection with you when you shared about your fig trees. Good to get to know you better, I enjoy your blog and need to get over here on a regular basis, all the best! Good luck on the challenge, I know you will do well my friend and we are all rooting for you, one fork at a time…. if I read correct, the final judging could be in popularity …. thank goodness for us, huh! Greg, fig freak for sure! Kelly, Thank you so much, but I think the competition is going to be really tough. Gina, so glad to get your support and thank you for the comment. Amanda, you are so sweet! Thank you! Ingeborg, always nice to hear from you, your desserts are always perfect! Claudia, thank you again! And I think you have some great entries also. Joan, you are so right, it was hard to keep it to 1,000 words, I left out a lot of things that needed to be mentioned. Gera, as always, thank you for your continued support, always enjoy your weekly roundup and coaching me with the blogging side of writing! Natasha, I so love your bon vivant travel series, the Greece and France posts have me wanting to fly away yesterday. Gitte, thank you so much! Patty, your fig bar recipe is wonderful, now I wish I had some fresh figs again! Drick, always a pleasure to see you and visit your blog. We need to get together soon and prepare for next year’s Mardi Gras seasonal posts. This post fleshes you out in a way that is impressively human, something that would never come out in, say, a glitzy tv show. Thank you for that, and good luck in the Food Bloggers Challenge. This is what it’s all about! So sorry to hear about your father’s Celiac disease. I know two children with violent allergies to wheat, and from their parents I’ve come to understand how serious that can be. I wish him well. I loved your post! I love what you say at the end too, you can’t choose your parents, but you can make your own choices. That’s what my grandmother always told me, and reinforced when I met my now husband, who I was reluctant to commit to because of his family. Great advice everyone should take. It is so fun to hear everyone’s background in this first challenge. Personally, your passion and recipes have made me a better cook. Good luck to you in the challenge! Fun to learn a bit more about you. Good luck! It will be fun to follow along. you’ve got my vote, Chef Ryan! yee-haw! Count my vote for CCR! Hi Chef Ryan! Wonderful post! ♥♥♥ – Megan- You have my vote too! Congratulations Chef Ryan on making it to the next step! !